The above info came from Jenny, and was edited by yours truly (contact me). The image came from Amazon.com. Yes! 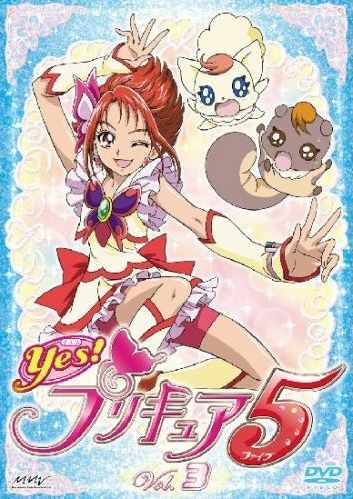 Precure 5 is a spinoff series from the Pretty Cure series, and is about a normal student named Nozomi Yumehara. She finds Coco, a cute little creature that is looking for a magical book called the Dream Collect. Coco comes from a different world called the Palmier Kingdom. Nozomi decides to help Coco restore his world, which is in the hands of an organization called the Nightmare Company. A pink butterfly that changes Nozomi into Cure Dream. Of course, she can't work alone so she must choose four students that will help restore the Palmier Kingdom. The above description came from Jenny, and was edited by yours truly (contact me).